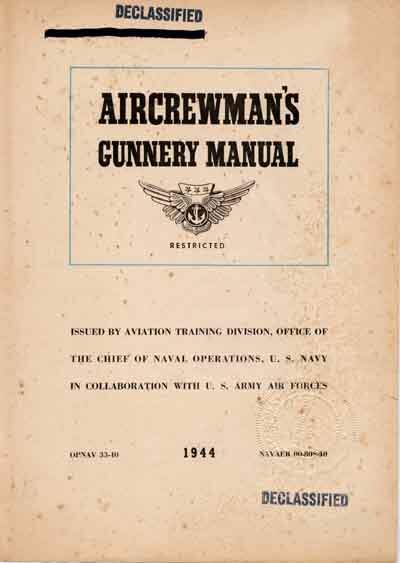 The Aircrewman's Gunnery Manual has been prepared under direction of the Deputy Chief of Naval Operations (Air) in cooperation with the Commanding General of the U. S. Army Air Forces. It is for use BY all the air gunners of all our armed forces. The suggestions here offered to you have been tested in combat against all types of enemy planes, Tinder varying conditions, in all the battle areas of the world. They will help you become a better gunner if you study them and then apply what you learn. Good luck and good hunting to you. I am a United States, Naval Aircrewman, member of a combat team. My pilot and shipmates place their trust in me and my guns. I will care for my plane and guns as I care for my life. In them I hold a power of life and death-life for my countrymen, death for the enemy. "I will uphold my trust by protecting my pilot and plane to the absolute limit of my ability. So help me God." On the day that you utter those words, you pin on your aircrewman's wings and become officially a member of a great fighting teama team that carries destruction to the enemy. You may be assigned to a carrier or you may be assigned to a land-based squadron. Wherever it is, your job is the sameto knock out of the sky any enemy plane that attempts to prevent your plane from going through with its mission; to add your fire power to the destruction of ships, troops, enemy installations or any target on the ground that offers you a good shot. You will teach the enemy to respect your guns. the carrier. You see photographs of the area over which you fly. You are told about the natives, the prevailing winds, currents, in short, everything you should know about the mission at hand. This briefing will usually be done in the eveningsin one-hour sessions, perhaps three or four days before the atack. 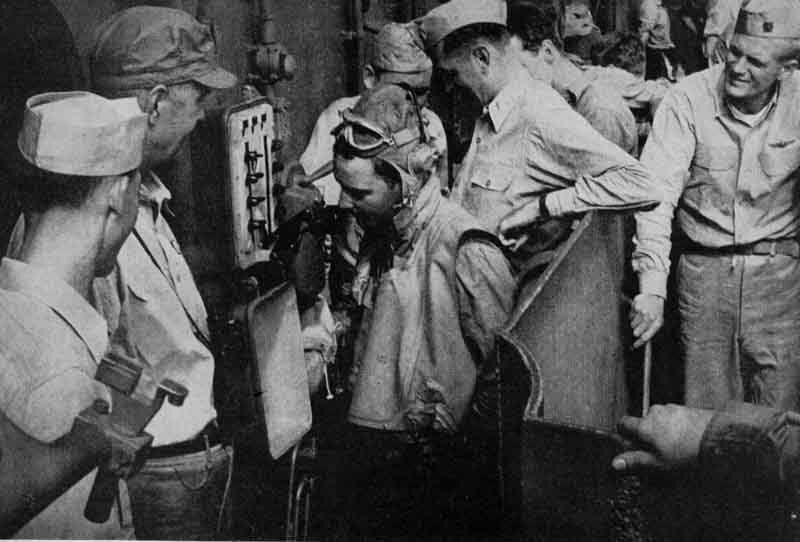 In the meantime, you cheek your guns and your equipment with utmost care, sinee your life, the lives of your fellow crew members, and the success of your mission depend on it. "Man your planes . . . Stand by to start engines . . . Start your engines." 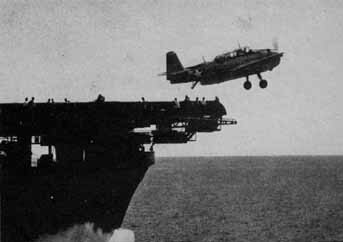 The fighters leave the deck first, followed hy the torpedo planes and the dive bombers. These are your planes. Your pilot makes his rendezvous with the other planes in your squadron and you head toward the target in formation. For a while you fly in formation. Suddenly, a hlack speck appears in the sky"A 'bandit at three o'clock high." This is the moment for which you have been preparing. You take aim. You open fire. In a matter of seconds, the enemy plane is in flames. The flight continues. You are over the target. 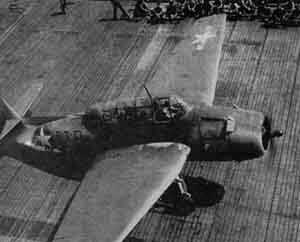 More enemy fighters. Your pilot does his job and you do yours. The mission is a success. The rendezvous for the return is made and you fly hack to your ship. After landing, you give your report to the interrogation officer. You have knocked down an enemy plane: you havedone your job as an aircrewman. Those weeks of training have paid off. All of the above occurs weeks after you first request to be an aircrewman, but from the time you start your instruction you are pointing toward the day of combat. A gunner's job is exciting. It requires courage, good nerves, and skill. 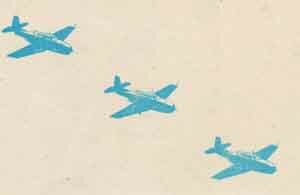 Bombers fly in formation for mutual protection, and you will usually have fighters along for additional helpbut the last word is yours. You must be a better man than your enemy. Whether you are the better gunner is up to you and you alone. 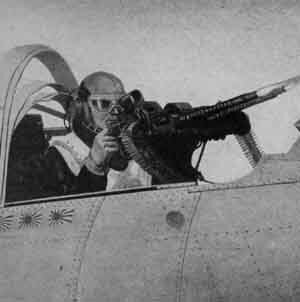 The Aircrewman's Gunnery Manual is designed to help you become an efficient gunner. It is divided into three parts: (a) Guns; (b) Sighting and sights; (c) Turrets. In the section on guns, you will find all the necessary information about your machine gun. In the sighting section, methods are discussed from a practical point of view, just as you will see the problem. Your sights are also explainedhow they work, how to maintain and boresight them. Finally, in the turret section there is a detailed discussion of ten important Navy Aerial Gun-turrets. As your training becomes more specialized, you will concentrate on one turret, but a knowledge of all turrets will make you better able to understand your own. In brief, the Aircrewman's Gunnery Manual is designed to give you all the available useful information needed in your work as a combat Aircrewman. Study it. Become familiar with it. If you don't let it down, it won't let you down.